Voidpoint, LLC and 3D Realms are making a new game in the old Build engine that powered Duke Nukem 3D. It has a preview campaign now available on Steam if you purchase the early access version. As of now, the preview campaign lets you play “Zone 1” of the game, and if this short segment is a taste true to the full game, Ion Maiden is an old-school Duke style shooter that you will want to play if you care at all about those games and the era they came out in. In Ion Maiden, you play as Shelly “Bombshell” Harrison of the Global Defense Force. Her codename is inspired by her bomb disposal skills, but she’s also plenty adept at shooting dudes and cyborgs. The big bad guy, Dr. Jadus Heskel, has a cybernetic army that, I’m betting, wants to take over the world. Shelly’s got other ideas, and she’ll be blowing them to cyborg smithereens in the now hectic streets of Washington, DC. The levels are not straight paths, but have multiple ways to go and multiple, vertical layers. There were a few moments I was stumped on where to go, à la Duke 3D. There are also keycards, and keypads for those keycards, and when you use the keypad with a keycard you see the keycard swipe over it. Now that’s what I’m talking about. I haven’t had a hard time finding any keycards yet, though if the game’s fully true to its roots, those moments are coming. The gameplay and style are exactly what is sold: you want Build-engine fueled classic FPS gameplay, you got it. The shooting is satisfying. I used a revolver, called “Loverboy,” an SMG, and a shotgun. The shotgun’s great. Like any good FPS shotgun, once I got it, all I wanted to do was shoot it, non-stop, for the rest of time. You also carry a police baton, assigned to the 1-key, and “bowling” bombs you can lob. There’s a special mode, Bombardier Trial, in which you can only use these bombs and just have 25 health. A shotgun is like a throwback FPS games’ T-Rex, and Ion Maiden‘s got it. Right at the end of the campaign, after felling the boss (there are bosses!) I picked up a big minigun. Alas, it was only a tease, as I hardly had time to look at it before the Zone Complete screen appeared. The game’s got old school violence. There’s blood and gibs, and you can kick some of it around, hearing little squish noises. If you have a taste for classic FPS carnage, you’ll find a fair amount of appetizers here. Like in Duke 3D and Blood, in Ion Maiden there are one-liner quips. Shelly will say “holy s—” when enemies blow apart. She’ll also say stuff like “I spray, you pray” when you pick up a weapon or “Cleanup on aisle your a—” when you mow down enemies. These lines aren’t used overmuch, and have their place complementing the game’s rad action-movie environment. The game’s environment looks and feels like the Build engine as you move through it. It’s easy to discern that Ion Maiden is cut from the same cloth as games like Shadow Warrior and Rise of the Triad. The same is true for the music. The tunes complement the 90s style and hearken back to 90s shooters. I wasn’t quite in heaven listening to it, but I was close. There are a few quibbles that may be resolved by the game’s completion, but I list them nonetheless. During the boss battle, I wanted to turn on god mode. Now, I did eventually beat it, but pressing tilde did nothing. There is a cheat option in the game’s menu, and I’m sure I could alter the game’s properties such that I could bring down the console, but, starting it cold, I could not. And though there were autosaves (except on the highest difficulty) there was no discernible, immediate quicksave option, though pressing F2 did bring up the save menu. There are also little spider-cyborg enemies that are really hard to aim at and kill, but the classic shooters did have these kind of enemies, so I guess they’re passable. Just spray – they’ll do the praying. Overall, if you enjoy games like the kind Ion Maiden is inspired by, you’ll enjoy Ion Maiden. That isn’t rocket science, but it does mean the game will deliver on its promise. To play the brief preview campaign, though, you’ll have to pay twenty bucks, or, until March 7, $17.99 USD. That’s a steep price for a bit of game content that’s shorter than the shareware versions of the 90s shooters it mimics. The full game releases Q3 2018. I paid the early access price because I love these games and the era they hearken back to, and I eagerly await more content and the full release. 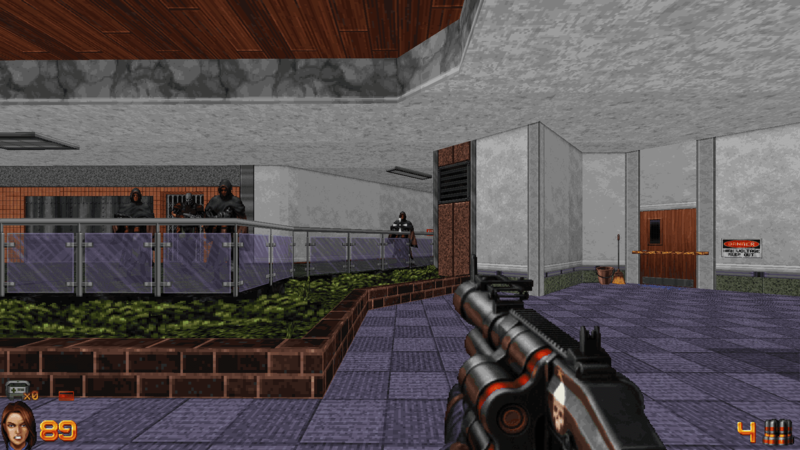 The Ion Maiden Preview Campaign was played in its entirety, sans all the secret areas, by Trevor, who purchased the early access version of Ion Maiden on Steam. If you’re interested in throwback FPS titles, also check out Trevor’s impressions of Dusk.